"Thy Doom is Nigh Plymouth". 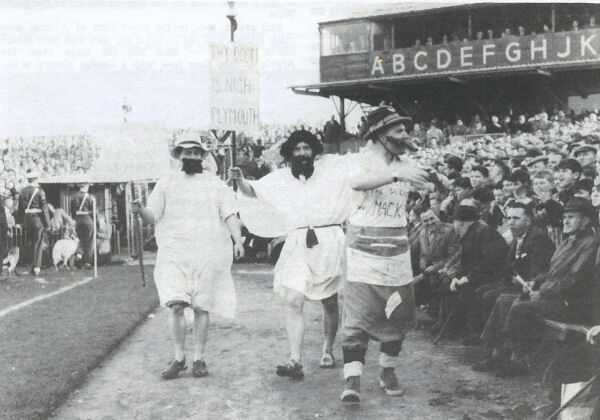 In the Barn Park / Mayflower corner, Spurs fans amuse the capacity 40,000 crowd. Who forged the score? What appears a 1-5 thrashing is almost as big a fake as those dozen or so tickets that caused havoc during the week. Let there be no complaints, for the double champions from White Hart Lane thoroughly deserved to win. They showed all the skills of the game that were good enough to take them to the final for the second year in succession without undue trouble. Plucky Argyle just did not deserve to be the side they stepped over en route. The half time score - 0-3 - was a completely false reflection. Argyle played well enough to beat most sides in this first period and actually outplayed their vaunted opponents in overall football. They took Spurs, as planned, as just another eleven men and produced style and slickness that must have shaken them. 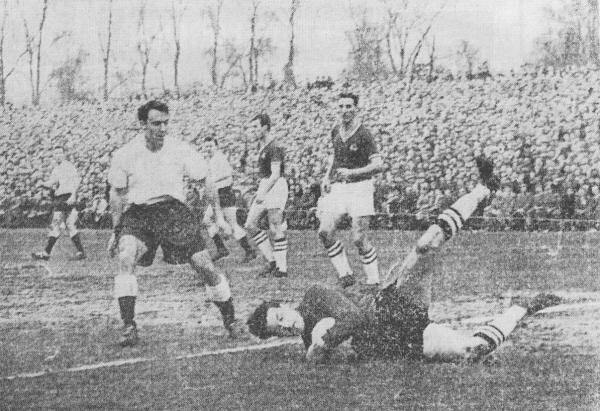 Jimmy Greaves is foiled as Dave Maclaren grabs the ball, watch by George Robertson. But the Londoners had the edge in finish and speed and inevitably with a high priced First Division side, the edge in basic skills. These factors gave them their three goal lead. No one can begrudge the Spurs their success. It was quietly accepted by the 40,000 crowd - yet that is just about all that can be said against Argyle. Even if it was needed, one could not say that a single home player had a bad day. From the goal to the wings no one let the side down. But what can you do against a team in which every man is a master of his trade? Their own followers were disappointed in their general form, but Plymouth fans stared in amazement as these artists chipped, slipped and tipped their way through the dragging mud. A misplaced pass is an event with this team; every man makes the ball his own and he can take and send it on its way in a flash. This is what beat Argyle. Spurs looked yards faster into the open spaces and their movements had a non-stop sweetness that even dogged Argyle could not turn sour. Only once did Argyle match them. Mid-way through the first half Johnny Newman, George Kirby and Jimmy McAnearney indulged in as clever a piece of interpassing as even the Spurs will show. They swept through with a series of flicks and back heels which took the inside left within an ace of scoring. There were other star moments too. 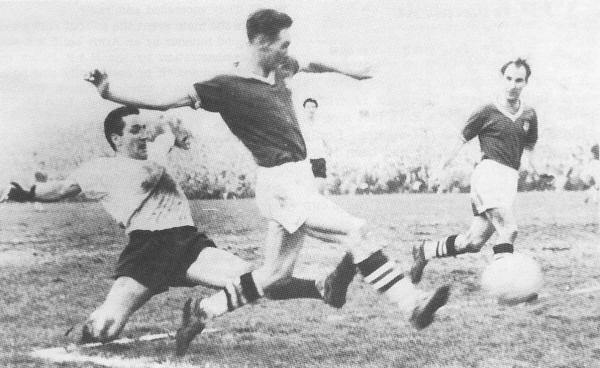 Newman frequently cruised through the vacant middle in complete command; Ken Maloy had a rare battle with Peter Baker; Bryce Fulton earned tumultuous applause for his tussle with Cliff Jones when the Welshman switched, and Johnny Williams nearly raised the roof with his first half shooting. Ron Henry, Peter Baker and Maurice Norman. Through all this the mighty Spurs purred on. Maclaren made three grand saves from John White, Jimmy Greaves and Cliff Jones and the outside left outjumped them all to head against the upright. These chances all came from swift incisive moves which left the attackers concerned almost in the clear; moves which cracked even the best laid plans of a gallant defence. That is no criticism, for the best defences in the country and Europe have gone under to this outfit. For an instant in the 24th minute we thought the Spurs might be human after all for goal merchant Terry Medwin sliced a gilt edged chance over a gaping goal. That impression lasted for just 60 seconds. Spurs swept back again. Les Allen gave Gordon Fincham the old one-two out on the left and slipped the ball in for his outside right to make amends. 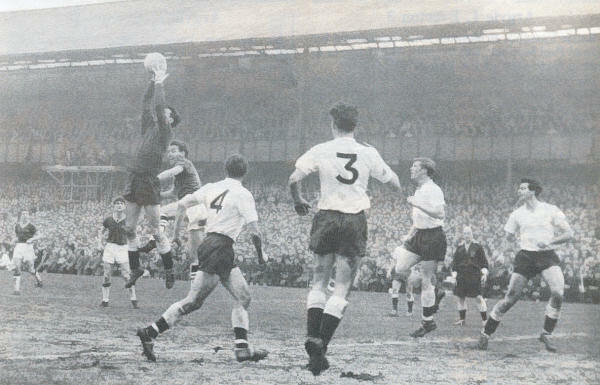 One minute Spurs were developing a move on the right when from out of the blue, Jones hooked a centre across and the mercurial Jimmy Greaves skied in a header which left Dave Maclaren standing. Even then Argyle might have made a shaking comeback for Baker just baulked McAnearney and Wilf Carter's flick was only inches outside the post. Just on time, however, the brilliant Danny Blanchflower pulled the simplest but neatest trick in the game by feinting to centre before sending Les Allen through. The centre forward's cross was rocketed in by Jones. I reckon everyone on the ground knew that was it. Well as Argyle had played, they were three goals down and even their most ardent fan could not back them to pull that back. In the 70th minute, Jimmy Greaves showed his six figure value by juggling and jinking his way through a packed defence. He showed two men the ball, took it away and then foxed Maclaren with a clever slice from close range. Jimmy McAnearney beats Dave Mackay, with Peter Anderson in support. There might have been more goals, but these were not the main concern - Spurs were home and that was what mattered. Despite that, a disappointed but not dismayed crowd showed their approval of Argyle�s performance with a rousing cheer when Peter Anderson at last got the ball into the net. Newman drove Bill Brown to a full length save; McAnearney hit the post and the winger finished it off. Five minutes from time White, the subtle stylist Argyle most feared, cracked in a fifth which went in off two defenders. Argyle put everything into the game and produced a fair brand of football but, as many teams will find, it was nowhere near good enough against the Spurs. They had their stars - but there is only one Danny Blanchflower, one Dave Mackay, one Jimmy Greaves, one John White and few copies around of the other members of a great side. Argyle - Maclaren; Robertson, Fulton, Williams, Fincham, Newman, Anderson, Carter, Kirby, McAnearney, Maloy. Spurs - Brown; Baker, Henry, Blanchflower, Norman, Mackay, Medwin, White, Allen, Greaves, Jones. Scorers: Argyle - Anderson; Spurs - Greaves (2), Medwin, Jones, White. Referee: Mr. R E. Smith (Newport). � Tottenham went on to win the Cup for the second year in a row, beating Burnley 3-1 in the final.